Curiously, a locomotive builder, the Hunslet Engine Works, decided to produce a small car. Apparently the wife of one of the directors wanted a car that was easier to park than her Jaguar. Henry Brown  designer of the tiny Rodley car  designed the unorthodox shape by sitting atop a Villiers engine while an assistant drew a chalk outline around him. The Mark I was essentially a low, stable, platform frame with the driver and passenger straddling a bench scooter-style. The strange, angelfish-like shape was made of fiberglass, but the two halves were joined vertically down the center. With a large door on the left side, and one of the largest parcel shelves in the industry, this Scootacar was quite roomy. Despite the five-foot height (it was named "the telephone booth" as many were finished in red), the little car handled extremely well. In 1959, it was decided there was a need for a more refined model. 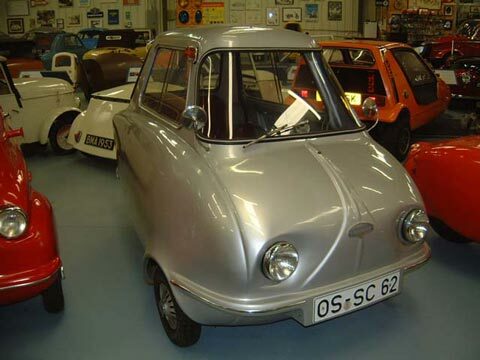 Rather than opting for a few minor changes, Scootacar came up with the Mark II, totally redesigned from stem to stern, with a larger body shell incorporating a sort of tail. The motor now lived under a large, plush, angled rear bench, while the driver sat on a proper chair, which tipped forward. While a very sound car, it appeared to late for substantial sales. In 1961, a 250 cc twin has fitted to about 50 cars, but few customers were willing to brave the 62 mph white-knuckle ride. Weight: 263 kg Electrics: 12 v 3 Wheels: 4.00 x 8"